This is what happens when you allow the alcohol industry to mark its own homework. Recently, the alcohol industry advertising self-regulator ruled that a school bus, filled with children and covered in beers, broke no rules of its ‘responsible’ alcohol advertising code. The 3034 is a designated school bus in New South Wales which travels from Ingleburn to Minto Station, stopping at three schools and an early-learning centre. On 6 July 2018 it was spotted on its morning school run covered in a whole-of-bus advert for The Bavarian pub, featuring child-sized pints of beer, topped with slogans including “BEERS BY THE BUSLOAD” and “17 BEERS ON TAP”. Why did it break no rules? In short, because the alcohol industry not only makes the rules, but also decides whether they have been broken. Taken at face value, the industry’s ‘Responsible Alcohol Marketing Code’ (the Code) seems like it would protect children from this kind of advert. It says that an advert should not specifically target children, should not be on merchandise for use primarily by children, and should not be placed where the audience is expected to comprise more than 25 per cent children. “[the placement rule] does not apply to outdoor advertising”. The school booze bus is not an anomaly. In July 2018, the industry self-regulator dismissed a complaint about an advert for Furphy beer in Victoria, which was located very close to a kindergarten. The industry’s Code says that alcohol advertising should not appear within a 150 metre sight line of a primary or secondary school. However, the industry self-regulator again found a way out on a technicality because “in Victoria a community kindergarten is not a primary school”. “Education within Australia is primarily the responsibility of the States and Territories. While the systems operating in each jurisdiction have more in common than they have differences each system nonetheless varies somewhat. One difference is the structure of the classes and age groups of children that attend primary school and whether kindergarten or pre-school is part of the primary school system or is separate from it. funded kindergarten is available to children in the year before primary school. Why should we protect children from alcohol advertising? The National Health and Medical Research Council (NHMRC)’s Australian Guidelines to Reduce Health Risks from Drinking state that drinking from a young age can damage the developing brain, and recommend that for people under the age of 18, not drinking is the safest option. The Guidelines state that “the evidence suggests that earlier initiation of drinking is related to more frequent and higher quantity alcohol consumption in adolescence, and those patterns are in turn related to the development of alcohol-related harms in adolescence […]”. Children and adolescents are vulnerable to, and influenced by, the messages contained in alcohol advertising. A large body of Australian and international research, including several systematic reviews of longitudinal studies, shows that exposure to alcohol advertising through a range of channels influences adolescents’ awareness of alcohol brands and their readiness to adopt alcohol consumption as a normal activity. Like tobacco, alcohol is a class 1 carcinogen. Risk of breast cancer, mouth cancer, throat (pharynx and larynx) cancer and oesophagus cancer is increased with any regular amount of alcohol and continues to increase with every drink. This means that there is no known safe limit for alcohol consumption (for adults and children alike). Alcohol advertising needs to be properly regulated and independent of the alcohol industry. The above examples illustrate that the industry is not sincere about upholding responsible advertising practices, or about protecting children from alcohol advertising. In addition, the industry’s advertising code is not fit for purpose and has too many in-built loop holes. Perhaps the worst one is that the industry’s placement rule – that an advert can only be placed where the audience is reasonably expected to comprise at least 75 per cent adults – will almost never be breached because only 22 per cent of the Australian population are children. It’s a nonsense. As demonstrated above, there are major loopholes around outdoor and transit advertising, meaning that alcohol advertising is permitted on designated school buses and on any bus stopping at a school, or in transit through school grounds. NSW and other jurisdictions should bring their policies in line with community expectations and measures put in place in other jurisdictions such as the ACT and WA. 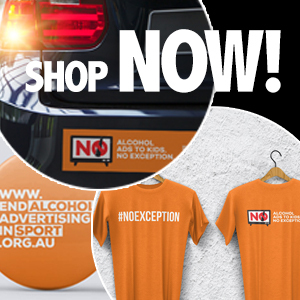 The ACT Government prohibits alcohol advertising on its buses. The Western Australian Government and Auckland Transport both recently announced bans on alcohol advertising on all public transport and transport waiting areas. Alcohol advertising in Australia is an interesting case study in self-regulation. Perhaps there are instances in which self-regulation has worked in other areas of society, but this is clearly not one of them. The industry’s ‘Responsible Alcohol Marketing Code’ is a PR exercise and a strategy to avoid independent regulation; it is not a sincere attempt to regulate. The Australian governments must do better to manage the activities of the harmful commodity industries, especially where children are targeted. When the booze bus returns the children back home in the afternoon, will they be told they can mark their own homework? It is important to note that despite the lack of regulatory action in the case of the school booze bus, the two complaints that were made about the advert did have an impact. In response to the public complaints, the advertisers decided to remove the advert and place it instead on a bus which runs from a depot that does not include any school routes. The message for us all is that weak regulatory environment not withstanding, members of the public can and must make their voices heard when they see alcohol advertising that does not meet community expectations.